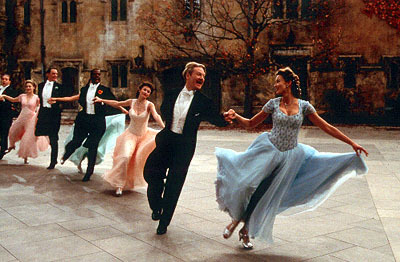 I get no kick from Champagne, but I get a big ol’ kick out of Kenneth Branagh’s 2000 version of Love’s Labour’s Lost. It’s set in 1939 France. World War II is looming and we’re updated several times during the film with faux newsreel footage. But everyone is quite stylish and elegant in Navarre. And the music is good. The music is very, very good with all those great Depression-era show tunes. Okay. Let’s be honest. The BBC took Shakespeare’s play at face value and delivered a true-to-the-text (and therefore very wordy) version. In stark contrast, Branagh throws caution (and maybe common sense) to the wind and delivers a trippy, giddy, easy-on-the-eye dreamscape of a musical. This is Shakespeare Lite. Emphasis on Lite. I didn’t analyze how much of the text is missing, but it’s significant — like all the boring parts! Really, you don’t get any sense at all of the wordplay and self-conscious erudition that permeates the original. It’s nearly pedantless! This is all fun and games. 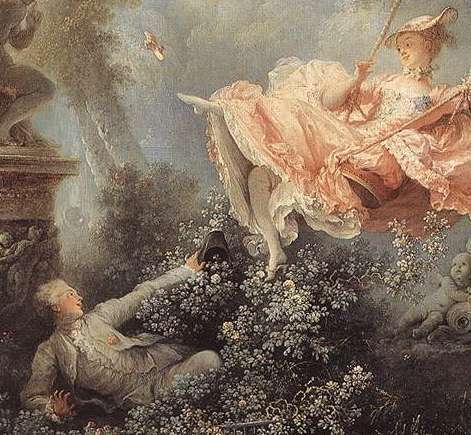 Heavy on the wooing, lite on the wit. Does it work? I find this film much easier to watch and more entertaining than the BBC version. Is it all good? I wouldn’t go that far. I actually hate Alicia Silverstone as the princess. She is just awful and barely delivers her lines. She’s the low point for me. And, well, I watch a lot of Scooby at my house, so it’s hard for me to see Matthew Lillard (who plays Longaville) and think of anything but Shaggy. Yet, it sorta works in this movie. 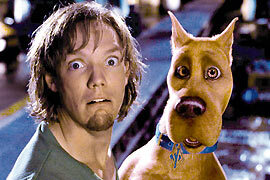 Longaville = Shaggy. Go figure. What’s good here? I love Nathan Lane’s Costard. And by far the trippiest character is Timothy Spall’s amazingly bizarre Don Armado. Wow, is all I can say there. Fun to watch. Weird, though. Really weird. I think my favorite scene is Don Armado singing Cole Porter’s “I Get A Kick Out of You” and sneezing cocaine all over another guy’s face, followed immediately by the princess and her ladies goofily waking up with their teddy bears in their tent and then going for a synchronized Esther Williams-style swim while singing Irving Berlin’s “No Strings (I’m Fancy Free)” from Top Hat with Fred Astaire. Yeah. I have to say I really don’t get this play (I mean Shakespeare’s version). I’m going to read it again before I post about it. 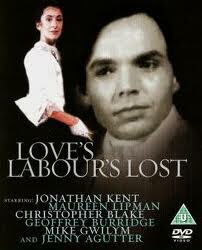 But whatever is in Love’s Labour’s Lost is surely lost in this film version. The play is about wordplay and satire; that is completely absent from this film. Yet, the film is entertaining — for sheer cheesy weirdness, really, more than great song and dance. Okay, enough of the hallucination. I’m going to get back to the text. I will report back. Hopefully, I’ll find it more readable on the second pass. Wish me luck!